The story of religious freedom in America is, as Kevin Seamus Hasson tells it, the story of the conflict of conscience against Puritans and Park Rangers. Puritans—named after the Plymouth settlers—“want to use the state to coerce the religious consciences of those with whom they disagree.” Park Rangers—hilariously named after a group of hapless San Francisco bureaucrats (read their story on pages 3–4)—“insist…that only a society that owns no truth at all can be safe for freedom.” Puritans represent aggressive religion, Park Rangers aggressive secularism. While they appear contradictory at first, they make the same underlying assumption: In the public square, one does not have the right to be wrong. Hasson narrates the 400-year battle of conscience against its foes briskly and humorously. Part One, “Learning the Hard Way,” shows how colonial Americans—with few notable exceptions—persecuted minority faiths, whether Protestant, Catholic, or Jewish. In New England, the Puritan establishment persecuted—through exile, torture, and execution—radicals within their own dissenting, Congregationalist tradition (e.g., Roger Williams and Anne Hutchinson), as well as Quakers. In the South, the Anglican establishment discriminated against, among others, Baptists. Other colonies—such as Rhode Island, Maryland, and Pennsylvania—were tolerant with a degree of Protestant diversity, but also drafted laws that legally privileged Protestants over Catholics and Jews. Part Two, “Groping for a Right,” narrates the evolution of religious freedom from “toleration” to “right.” The former conceives of religious freedom as a grant of government policy. What government gives, however, it also can take away. The latter conceives of religious freedom as something that inheres in the human person, which can be claimed against government policy. In American history, the clearest expression of the latter view—the one that prevails today—is the First Amendment to the United States Constitution, which begins: “Congress shall make no law respecting an establishment of religion, or prohibiting the free exercise thereof…” But, as Hasson notes, in its original context, the First Amendment, while admirable, applied only to the federal government. It left the state’s various established churches intact. Indeed, it was designed to do precisely that. Part Three, “Authentic Freedom,” traces developments in religious freedom after the passage of the Fourteenth Amendment. That amendment, passed in 1865 in the aftermath of the Civil War, extended both citizenship and “the privileges or immunities of citizens” to “[a]ll persons born or naturalized in the United States.” In ensuing years, the Supreme Court ruled that the privileges and immunities clause incorporated, to varying degrees, the Bill of Rights against the states. The application of the First Amendment’s free exercise clause was straightforward: No government agency (state, federal, county, municipal) could prohibit a citizen’s free exercise of religion. But what does the incorporation of the establishment clause against the states mean when one of the express intentions of that clause was to leave state establishments of religion intact? If you understand that conundrum, you understand much of the confusion surrounding the Supreme Court’s religious freedom jurisprudence. The best reason…for recognizing the full scope of religious freedom is that it’s the quintessentially human thing to do. Conscience, as we’ve seen through the book…is our humanity at its best. It’s what drives us to pursue our mind’s quest for the true, and our heart’s search for the good—our quest for God, ultimately—and then insists that we express and live accordingly to what we believe we’ve found. And it’s what entitles us to religious liberty. In other words, conscience arbitrates what we think to be true and what we feel to be right, and then requires us to live—socially, publicly—accordingly. Allowing people to live according to conscience creates a genuinely diverse society, one where people arrange their affairs according to their best lights, in cooperation with and without coercion by others. Claiming religious freedom as a right for yourself entails that you recognize in others a right to be wrong (at least according to your lights). Only by recognizing this right to be wrong can we end the culture war over religion, in which Puritans try to impose a one-size-fits all religion on a religiously diverse populace and Park Rangers try to scrub the public square of any reference to religion at all. 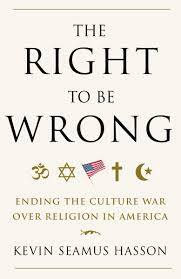 The Right to Be Wrong is a short read (154 pages of text), but it narrates the history of American religious freedom quickly and neatly summarizes the argument in favor of a broad construal of it. Highly recommended.